Having never heard of this skincare line before, I was really eager to try out Caudalíe Vinoperfect Radiance face serum. We’re all looking for that natural glow, and with this face serum, you absolutely achieve that. As a milky serum, this gives off a very natural feeling to it. It almost feels like you’re applying aloe vera or some sort of pulp from a plant directly onto your face. 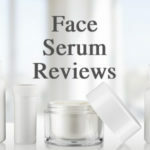 While that may sound weird, it was an extremely easy face serum to include in my morning and night face routines, and the results were almost instantaneous. As a skin-brightening serum, Caudalíe Vinoperfect Radiance face serum does an incredible job at evening out skin tone, fading sun spots, and giving your skin an overall healthy glow. However, it falls short when it comes to hydrating your face. At this price point, and compared to other face serums on the market, I think Caudalíe Vinoperfect serum is worth the money you pay for it! Caudalíe Vinoperfect Radiance Serum is a milky serum, so it’s much different than any other face serum I’ve ever tried before. While the serum itself isn’t very thick, it does have a much different consistency. It really does feel like you’ve combined milk and aloe vera pulp and applied it to your face. The consistency of the serum made it very comfortable to wear on my face. It did leave behind a bit of a sticky residue, which didn’t fully go away even after other cosmetics were applied on top. This did not impact the effectiveness of the other products, such as my moisturizers, nor did it impact how my makeup looked. Overall, it was a very comfortable face serum to both apply and wear! Application of Caudalíe Vinoperfect Radiance face serum is super easy. You use the serum both morning and night, and apply it to your face, neck, and décolleté. I opted to only apply it to my face and neck because it does leave a sticky residue behind, which was slightly uncomfortable when I dragged it down to my décolleté. The sticky residue did make it slightly more difficult to apply my moisturizer and acne cream on top of the face serum. However, it didn’t impact the effectiveness of those products. I was also happy to see that my makeup looked AWESOME with this face serum underneath. Even after you’ve applied it, it leaves you with a glow that I felt shone through under my makeup. The drying time for Caudalíe Vinoperfect Radiance Serum is about 45-60 seconds, so it’s definitely a face serum that takes longer to dry than others. I will also say that it never totally dries. You can definitely tell that the product has begun to sink in to your skin, and it doesn’t feel wet on your face or neck. However, there is an obvious sticky residue left behind. It’s definitely not uncomfortable—it’s just a sign that you have the product on your face. I absolutely LOVED the smell of Caudalíe Vinoperfect Radiance face serum. It smells like the product has been created with all natural ingredients found in vineyards and other places in nature. The best way I can describe it is aloe vera and eucalyptus, although I don’t think I’m doing the smell justice. It’s just super fresh and the scent feels very high-end, as well. The scent doesn’t stick around once it’s dried on your face, and that was a disappointment to me because of how good this face serum smells! 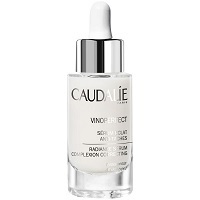 As I do with every new face serum I try, I applied Caudalíe Vinoperfect Radiance serum at night first. When I woke up the next morning, I honestly feel like I could already see a difference in my skin tone. My skin looked very calm—all of the redness I had on it was completely gone. I also feel like I could see a very minor change in some of my darker sun spots. The biggest change was how radiant my skin looked. That was immediate with this serum. I felt like I had applied a moisturizer that had glitter in it or something. I just had such a nice natural, healthy-looking glow to my skin. When it comes to Caudalíe Vinoperfect Radiance face serum, it totally delivers on what it says it’s going to do to your skin. I saw a huge difference in my sun spots. I even had some spots disappear that I thought were freckles but were clearly sun damage. My skin just looked so healthy and my skin tone was so even after using this serum for just a week. It almost felt like I didn’t need to apply any foundation—that’s how smooth my face looked. The natural glow that this face serum gives your face, too, is almost unreal. 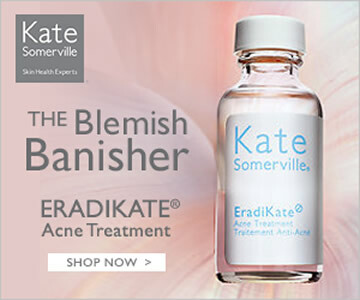 It really does live up to its name of being a radiance serum. So overall, I was super impressed with how this face serum performed. The only area I would say this serum could improve in is the hydrating aspect of it. 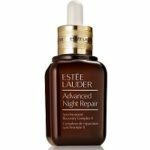 I did find that my skin didn’t feel quite as hydrated when I used this serum, and I even experienced a couple of dry patches around my mouth. So I would say that this face serum requires a heavier skin moisturizer to apply on top of it than other face serums I have tried in the past have. 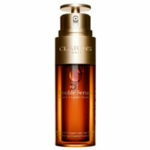 At $79.00 for an ounce, Caudalíe Vinoperfect Radiance face serum is definitely worth the money you pay for it. 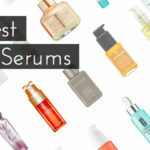 It delivers on all of the claims it makes, and I genuinely felt more confident with my skin as a result of using the serum. It’s also a much different face serum than what you will find on the market, and I really enjoy those unique aspects of the serum. I would simply caution anyone who has dry skin or is prone to dry patches on their face to use a heavy-duty skin moisturizer with this product. But overall, I definitely think the price tag reflects the results you’ll achieve! Caudalíe only accepts returns and exchanges on unopened product 14 days after purchase date. To purchase Caudalíe Vinoperfect Radiance Serum, click here.